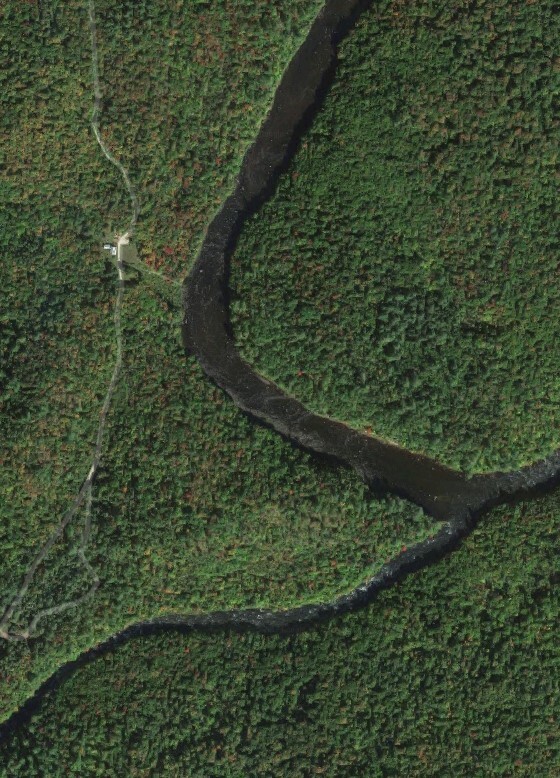 Skip and I planned an overnight trip down the Hudson River from Harris Lake, Newcomb to the Gooley Club take out near Indian Lake a distance of about 14 miles encompassing several Class II and III rapids. There are two designated two takeouts. The first is 7.3 miles from the launch at a steel bridge (just below the confluence with the Goodnow River). The second is six miles farther downstream, at the confluence with the Indian River. There is one designated camp site at the confluence with the Cedar River. After dropping off our shuttle vehicle at the Gooley Club take-out we launched from Harris Lake at 1100 under perfect weather conditions. We were hoping for water levels at or slightly above the 3 foot mark, but began the trip at 2.8′ and ended up at 2.6′. Depending on the water level, the white water can range from nearly Class III rapids to rocky riverbeds that require lining. In total there were about a dozen rapids of various difficulties. We wanted to camp at the confluence of the Cedar River which we estimated would entail another ~2 hours of travel. What we didn’t anticipate was the effort in portaging around the old log dam a few miles downstream from the bridge. We exited river right but didn’t find a carry trail and spent another hour exiting, scouting and carrying our canoe and gear. Below the dam we lined our boat further downstream until we could achieve a clear line of passage. Surprisingly quick it seemed we were at the Cedar River campsite. The Cedar River campsite is located immediately below the Cedar River on the river right (western) bank of the river. (43.8522°N, 74.1894°W) indicated on maps as being on the point at the confluence of the Cedar River. This was a nice campsite, but the steep banks and fast current made the landing and exiting of our canoe challenging. Adding to the drama was a set of rapids just downstream which motivated one to not miss exiting. Two miles downstream from the confluence of the Cedar River and eight miles downstream of the Polaris Bridge is the Hudson River Take-out, located 0.2 mile upstream of the confluence of Indian River. The final take out is located on the right side of a sharp bend of the Hudson River just before he confluence of the Indian River. The metal roof of the Old Gooley Farmhouse (43.8275°N, 74.2008°W) Google Maps may be visible from the Hudson River. Portage is up the hill through the field. 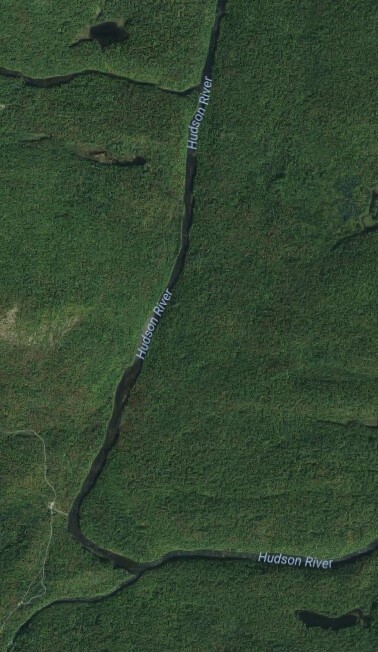 A 2nd ‘official’ portage is located a few hundred feet downstream and marked with a sign, although the sign may be obscured by vegetation. The river at the take out is deep and the trail up requires climbing some steep ledges. Parking at the ‘official’ take out is limited to one vehicle. Shown below left is the confluence of the Cedar River and the Gooley Club take out site just north of the confluence of the Indian River. The image on the right provides a close up of the Gooley Club take out. 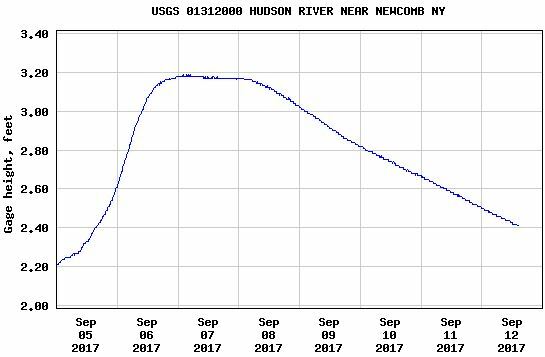 We were hoping for water levels at or slightly above the 3 foot mark, but began the trip at 2.8′ and ended up at 2.6′. Depending on the water level, the white water can range from nearly Class III rapids to rocky riverbeds that require lining. In total there were about a dozen rapids of various difficulties.